The building in which I work has an entrance area that is open to the top of the building, three stories up. There are windows (mostly small) on that top level (along the lines of a clerestory) and a wood-panel ceiling. If someone referred to this area as the atrium, would you find that jarring? If it would, what makes this area not an atrium? Do you only use atrium for areas with skylights? Does an atrium need to be central to the building, rather than in the entrance? I bring this up because the first few times someone called it an atrium, it definitely sounded wrong, but today someone referred to it as a rotunda and suddenly atrium doesn’t seem so far off. Definitely not an atrium, unless they add a skylight or a (literal) glass ceiling. But looks too rectangular to be a rotunda. I guess I’d call it an entryway or lobby. Lobby is another word that people use in several different ways. I use lobby to refer to the ground floor entryway only. Some people, however, will talk about the area near the elevators as a lobby, even if it’s on an upper floor. I think being the entrance area is totally consistent with atrium status — that’s actually the more common usage to me lately. 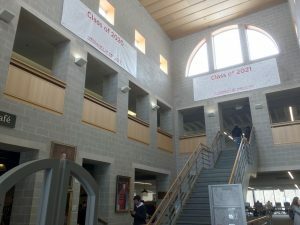 But atrium does imply lots of natural light. I don’t think it necessarily has to be a skylight/glass ceiling as such, but it would have to have large, high windows at a minimum. Perhaps “foyer”? It appears that usage is conventional, and it certainly wouldn’t seem jarring to my ears. The Mac dictionary has (after the Roman meaning) “a central hall or court in a modern building, with rooms or galleries opening off it, often glass-covered,” which is consistent with how I hear it used. I think even most atrium hotels don’t actually have glazed roofs.